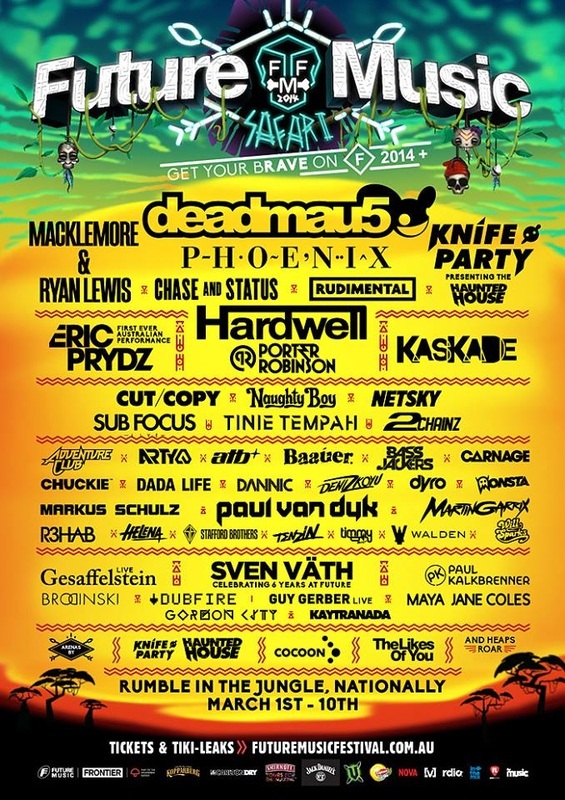 Prepare to get Madagascar-azy as Future Music Festival unleashes the first round artist line up for 2014! This epic expedition of Future Music Festival sees some of the biggest artists in the world today sharing the stage alongside the freshest new talent... get ready to see why FMF is still king of the jungle! views on YouTube, and topped triple j’s 2012 Hottest 100 and the Billboard Hottest 100 with Thrift Shop and Can’t Hold Us. With their distinct French flavour, much-loved indie outfit Phoenix will be bringing their danceable beats, layered synths and soaring hooks to FMF. Having headlined Coachella, tracks like Lisztomania, Entertainment and Trying To Be Cool will have the crowd screaming for more! Peek into the EDM hut and you’ll find the biggest acts that the world has on offer. One big fan favourite from Future Music Festival 2013, Hardwell’s ascent in the past 12 months has been meteoric. Back by popular demand and touted by many as the next #1 DJ on DJ Mag’s Top 100, the sky’s the limit for Hardwell - and we just can’t wait to have him back. FMF is also thrilled to announce that Eric Prydz, one of the world’s most renowned and respected DJs, will be visiting Australia for the first time ever! Joining Future Music Festival, the elusive DJ and producer has dominated more than just the EDM scene, with three singles cracking the UK charts. Championed by heavyweights like Zane Lowe, the Swedish mastermind will show you why festivals everywhere are fighting to get him on the bill! Rounding out our epic set of headliners is homegrown heroes Knife Party, who’ll be hosting their fearsome Haunted House arena production as debuted at Reading and Leeds festivals in the UK and Ibiza this season. Already boasting an energetic, awe-inspiring live performance ethic, this unstoppable duo take their live show to new, spine-tingling heights. Renowned for sets jam-packed with adrenaline, masterful dubstep tricks and epic bass drops that have sent crowds bonkers around the world, don’t miss them tearing it up as they return to home soil.